A woman went to a local emergency room due to fevers and chills. She reported that she had traveled abroad to Burma and Thailand recently for three weeks. 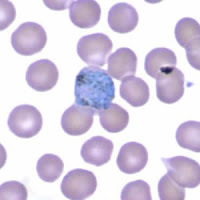 When she traveled abroad previously, she had taken malaria prophylaxis that she received from a travel clinic, but she had not returned to the clinic before her most recent trip. 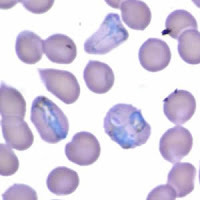 A blood film examination was ordered, and thick and thin smears were made and stained using ENG Scientific Malarial Quick Stain. What is your diagnosis? (Species level identification) Based on what criteria? Enter your answers in comments section. Check out the site for answers on 02Jan09! Bingo ! Maheswari gets it right. Congrats to Maheswari for the right answer and bagging the New Year Gift ! 2. 1st and 3rd picture is the trophozoite (amoeboid form seen). 3. 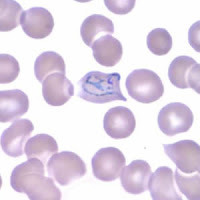 2nd picture is the gametocyte.